We decided to spend some time with Mr MoaB's family this year for our holiday. The expense of our car troubles in June curtailed our original plans to hire a cottage somewhere so we had to find an alternative. Staying with family up North was the ideal option. We got to spend time with family that we only get to see a couple of times a year and accommodation was free as we stayed with Mr MoaB's Mum. Usually when we visit we spend a lot of time visiting the extended family but this time we wanted to visit local places. As I'm not from up North, I don't know the area at all and had made a wishlist of places to visit before we went. We managed to tick off two of these and will save the others for another time we visit. We drove up on Tuesday evening after Little Miss A had been to nursery. We thought she'd fall asleep for the whole journey as it was around her bedtime and she'd had a really busy day, but she had other ideas! She kept us entertained with her singing and antics in the back of the car. We had a really good run up there and it only took 3 hours. When we awoke on the Wednesday morning it was a really glorious day so we decided to head to the beach to make the most of the weather. 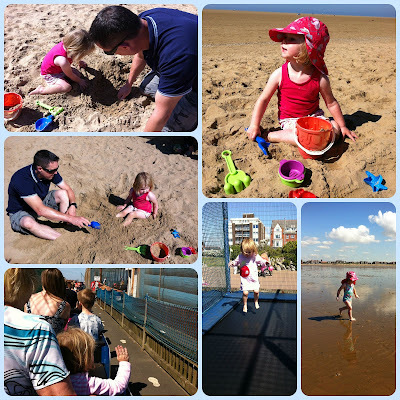 On our to do list was St Annes Beach which was just 30 minutes away. We parked up and headed straight onto the beach. We couldn't believe how much space we had on the beach. 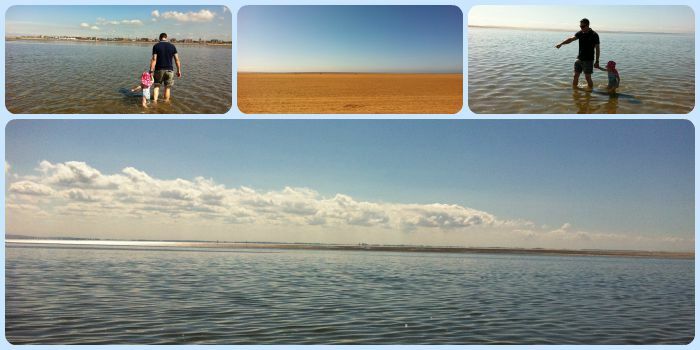 A hot day in the school holidays and we had whole sections of the beach to ourselves! Little Miss A immediately set about building some sandcastles. 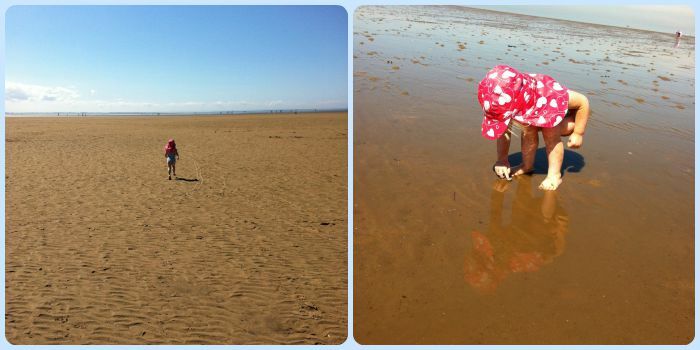 It's amazing how long sand can keep kids entertained! We then set-off for the long walk (or run in Little Miss A's case) down to the sea! The tide was a long way out! We did a bit of shell collecting along the way. We then had a great paddle in the sea. The water was actually pretty warm as it was so shallow. Little Miss A went out quite deep with Mr MoaB! We headed back to the beach where we had left Grandma with the bags and had our picnic lunch. Little Miss A spent more time playing in the sand again than eating! We then went for a wander along the beachfront and stopped for a coffee and ice-cream in a little cafe. When we had parked up in the morning, Little Miss A had seen some of the fair rides so we promised her a go on something before we left. She chose to have a bounce on the trampolines. Also, I'd seen there was a little train and I'm a sucker for having to go on these wherever we go, so we all had a trip round on this too! We had such a great day. The weather was so nice. We really could have been abroad somewhere, it really didn't feel like we were in the UK! On the way back home we stopped at a playground in Lowther Gardens, Lytham. Little Miss A had a great time on all the equipment. We then headed home for a birthday tea as it was Little Miss A's cousin's birthday. So a brilliant first day of our holiday and it didn't get any less busy as the week went on!